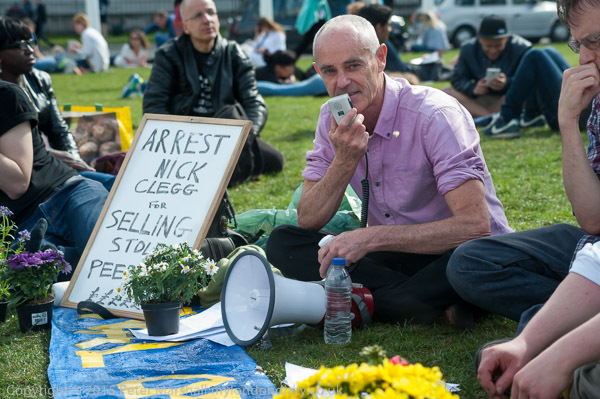 After a large rally in Trafalgar Square, National Gallery staff striking against privatisation marched towards the Sainsbury Wing, holding a sit down and short rally outside after police blocked the doors to the gallery. The gallery doors were then locked. Cany Udwin, a PCS rep at the National Gallery has been sacked for her trade union activities in connection with the plans to privatise gallery staffand the opposition to it by staff. Exhibitions in the Sainsbury wing have already been guarded by privatised staff, and the securitym there is also run by the private company. On the anniversary of the 1967 declaration of Biafran independence, Biafrans called for UK government support in getting back the country which they claim was taken away from them by the Berlin Conference in 1884 and incorporated into Southern Nigeria. As well as backing the call for independence the protest also remembered those who died in the Nigerian-Biafran War. In 1914 the finances of Northern Nigeria were in a mess,and the British decided to unite North and South Nigeria. Biafrans declared independence from Nigeria in 1967, but lost the long and bloody civil war that followed, with many Biafran civilians dying of starvation. 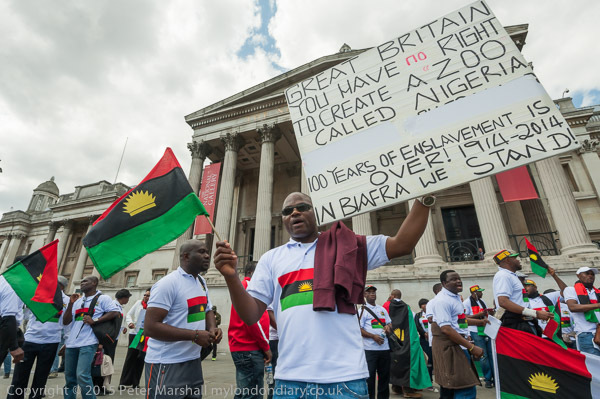 Many of those taking part in the protest wore t-shirts with the Biafran flag and coat of arms, and waved Biafran flags. They say Biafra is derived from the Kingdom of Nri of the Igbo people, which lasted from the 10th century to 1911 and was one of Africa's great civilisations before the European colonisation. The banner was painted with the message '£12 bn more cuts £120 bn tax dodged - AUSTERITY IS A LIE'. UK Uncut supporters marched from Waterloo to Westminster Bridge where they spread a large piece of cloth on the roadway and painted a banner telling Parliament that collecting dodged taxes would bring in more than cutting public services. They lifted up the banner and then 'dropped' it over the side of the bridge. It was a long run to take a picture of it, and I'm not sure worth the effort. Another group of protesters in Parliament Square were protesting against the plans to get rid of the Human Rights Act, and some of the UK Uncut people had joined them before the end of the 'Art' protest. 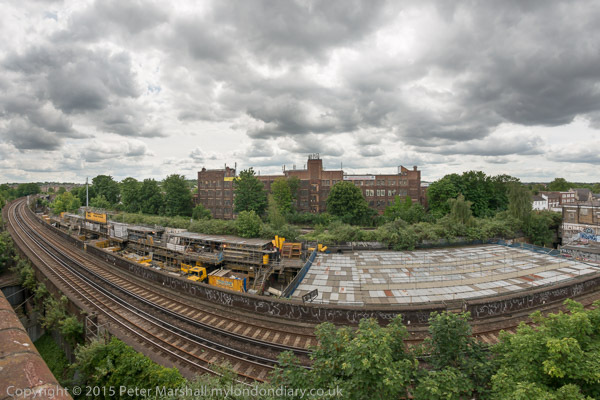 Many took the opportunity of guided tours and detailed maps to walk alongside the proposed Peckham Coal Line elevated linear urban park between Peckham Rye and Queens Road Peckham stations as a part of the Chelsea Fringe events. The publicity was perhaps misleading as it seemed to suggest that the walk would be on the proposed line, which except for a short section it wasn't. And to compare it with the New York 'High Line' was completely over the top, not least because of the very restricted views even from its elevated section - which we were unable to see. The actual coal sidings on the viaduct after which the walk is named could only be viewed from the top of the Bussey Building or high up on the multi-storey car park some way to the north. 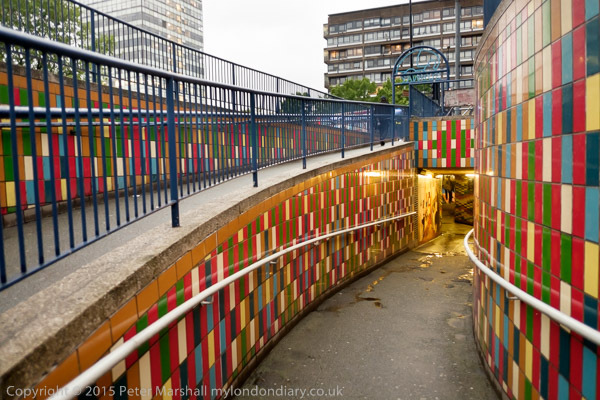 The walk is essentially an urban linear park that would make a useful short cut for some local walkers and cyclists, and could also be a part of a longer leisure walk from Brixton to the Thames. I hope it comes into existence, as the cost would be relatively low and it would be a useful addition to the area. More interesting than the Coal Line are both the Bussey Building in the former industrial estate Copeland Park and the multistorey car park. Saved from demolition by a locals, the Bussey Building, reached by an alley between shops in Rye Lane, houses small businesses, artists, faith groups, art spces and a rooftop bar.The multi-storey car park on its upper floors now has a cafe, a local radio performance space and another rooftop bar, next to the Derek Jarman memorial garden, as well as better views than the Bussey across Peckham and to central London. Part of the Coal Line is already open to the public as a small nature reserve, left by the railway line after a scheme for a massive inner-ring road was fortunately abandoned. Its legacy is a hefty wall along part of the edge of the service road by the Cossall Walk line of flats. 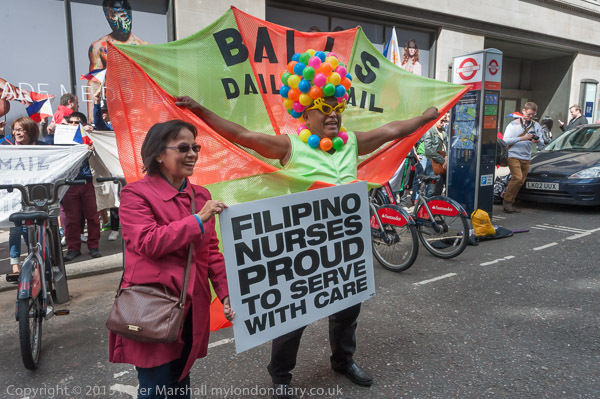 'Filipino Nurses - Proud to serve with care' - 'Balls Daily Mail'! 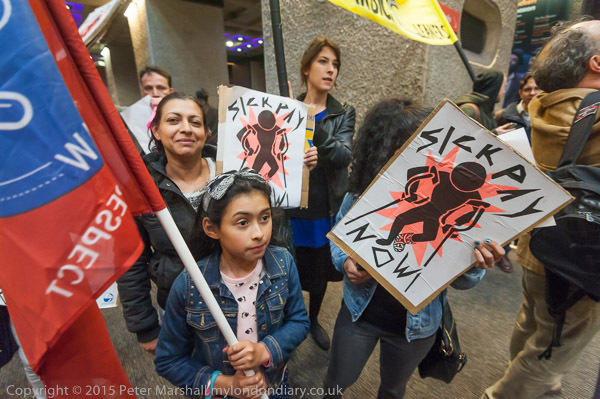 Filipino health workers protested outside the Daily Mail over its reporting of the Victoriano Chua case which insulted Filipino NHS workers as a whole despite the vital contribution they make to the NHS. The want the Daily Mail to apologise and to recognise the contribution that they make. 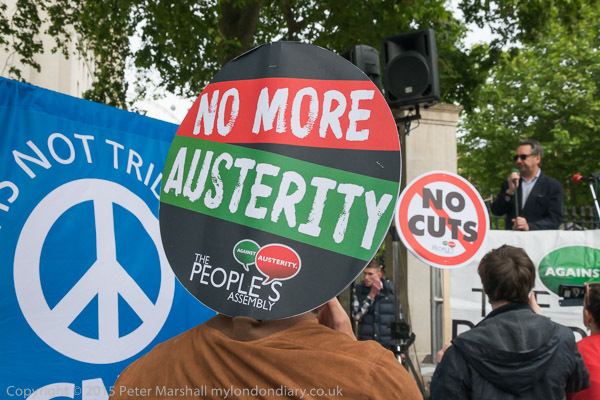 The People's Assembly held an End Austerity Now rally as a part of their broad united national campaign against austerity, cuts and privatisation in our workplaces, community and welfare services at Downing St on the evening of the Queens Speech with several hundred attending. Ahwazi protesters joined the mainly student anti-austerity National Campaign Against Fees & Cuts protesters in London to call for an end to the Iranian attacks on their heritage and identity. Their homeland, which includes most of Iran's oil, was occupied by Iran in 1925. 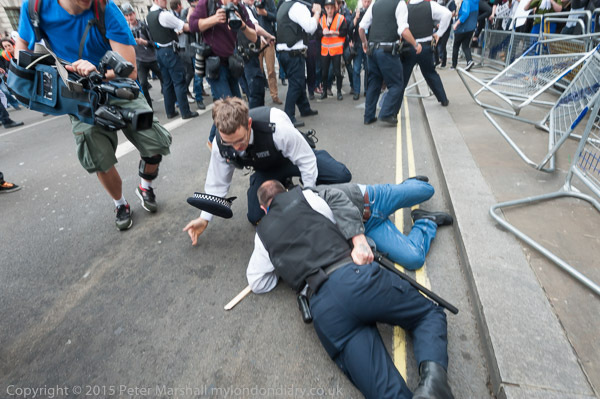 After a brief rally in Trafalgar Square, students in the National Campaign Against Fees & Cuts set off down Whitehall, where police made an unsuccesful attempt to stop them, arresting several forcefully. There seemed to be little point as police numbers were clearly too few and many protesters were simply walking around them and the barriers as I did. Otherwise as students marched around Westminster the event remained peaceful. As I left they were marching back up Whitehall, possibly heading for Buckingham Palace. Students and other supporters of the National Campaign against Fees and Cuts met in Trafalgar Square, climbing with banners on to the plinth below Nelson's column, where there were a few short speeches before they left for a march. As well as the NCAFC who organised the event, there were also banners from Class War - they brought the replacement political leaders banner, as police in Bethnal Green are still holding the 2010 election one they took last month. Also taking the stage and marching with the students were the Hashem Shabani group of Ahwazi Arabs, who later held their own protest. 'Disco Boy' Lee Marshall from Kent who runs discos at local events brought a mobile rig to Trafalgar Square before the NCAFC protest there and had people dancing around the square before going on to perform elsewhere, including outside Downing St.
Lee Marshall - AKA Disco Boy - who describes himself as an "entertainer prankster DJ host", has gained a huge social media following, with his video stunts watched by hundreds of thousands of people. People saw a man being arrested and grew angry when police refused to give any reason for the arrest. A crowd followed him being taken to a nearby police van. A police officer assaulted a young bystander who was then also arrested. By the end of the protest as the two arrestees were being taken away in the police vans it emerged that the man had been arrested as he had been identified as someone who was wanted for an earlier unspecified offence and was being taken in for questioning, The arrest was not related to the protest that was gathering, and had police immediately made this clear the incident - and the assault and second arrest could have been avoided. 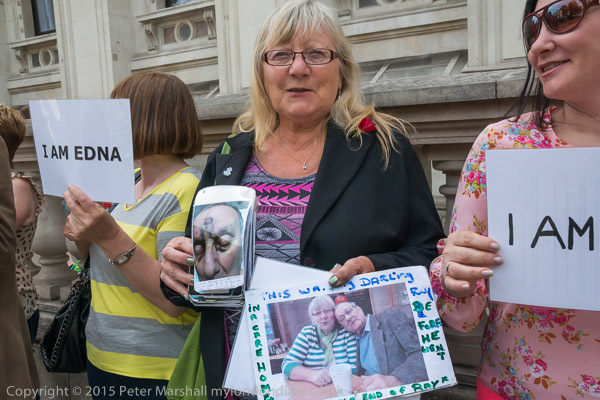 A line of people held up posters and shouted 'I am Edna' at Downing St calling for a law which would make it an offence not to act on the genuine concerns of a whistleblower and to protect those revealing scandals in social care and other sectors. Compassion in Care who organised a petition and this event are campaigning for Edna's Law (named after an elderly woman abused in care home) which would make it a criminal offence to fail to act on the genuine concerns of a whistle-blower, and would make the state protect whistleblowers rather than them having to spend thousands of pounds on taking their cases for unfair dismissals to industrial tribunals. Edna's Law would replace the Public Interest Disclosure Act which has failed to protect the public, the victims or the whistle-blowers. They say that the recommendations of the recent Francis review "will do nothing to protect whistle-blowers or encourage anyone else to raise concerns. This is because his recommendations rely on employers and regulators – which include the very same people who have “got away with” cover-ups, ignoring concerns, and victimising whistle-blowers for many years." "Edna's law based on evidence from 1500 whistle-blowers, given to Compassion In Care." Class War arrived too late to reach the centre of Parliament Square, but managed to briefly display their political leaders banner on the corner of Parliament St before police forced them to put it away. Police followed them for the next 6 hours, threatening some with arrest. After they moved away from Parliament Square to a pub in Storey's Gate there were around 50 police standing around watching them, including a squad of TSG, outnumbering Class War by over two to one as some were still being followed by police elsewhere, and it looked as if police were intending to kettle the group and make arrests. But after standing around looking menacing for about an hour, most of them left, with another, rather smaller group of officers taking their place, who were still there when I left half an hour later. 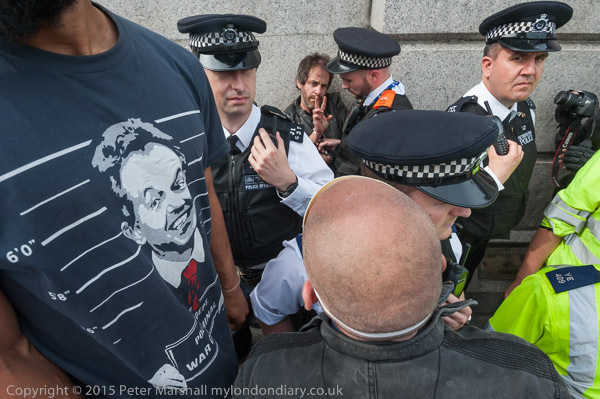 Earlier, while Class War were still in Parliament Square, the police arrested two men a few yards away. One has been told earlier he must not display a poster with a message about austerity being stupid. The two insisted that they had committed no offence, and they and were released a couple of hours later without charge. A world-class sculpture walk, 'The Line' with works by distinguished sculptors going north from Greenwich to the Olympic Park was opened in a ceremony at the revitalised Cody Dock, an art and community centre on a former gas works site in West Ham. I went to Cody Dock at the start of festivities in the morning and walked a short distance along 'The Line', viewing works by Damian Hirst and, rather more interestingly, Abigail Fallis, whose DNA SL90 (2003) was made from 22 shopping trolleys for a supermarket chain to mark the 50th anniversary of Crick & Watson's discovery of the double-helix structure of DNA. It's location on the edge of Bow Creek next to a major distribution centre, seemed particularly appropriate, and it is an impressive piece. I then went to photograph other events in central London before returning to Cody Dock just in time for the opening ceremony, by which time a fair sized crowd was enjoying the events there. The area around Cody Dock was once one of the London's gas works, built by the Gas Light and Coke Co in 1873, as well as other related industries and a power station. Coal to make gas and coke was brought in up Bow Creek to Cody Dock, als known as 'Gasworks Dock'. Derelict until a few years ago, the dock was spotted by Simon Myers as he came up Bow Creek. He realised the potential of the derelict gas works dock and has led its redevelopment, getting support from local residents, companies and other bodies for the project, speaks at the opening of 'The Line'. Myers and others spoke briefly at the opening ceremony, before one of the many volunteers who have worked on the Cody Dock project came and cut the red ribbon that had been stretched across the exit to 'The Line' from the dock and it was declared open. 'The Line' starts at North Greenwich, taking the dangleway to the Royal Victoria Dock and then on to Cody Dock via the DLR and a five minute walk from Star Lane DLR station. 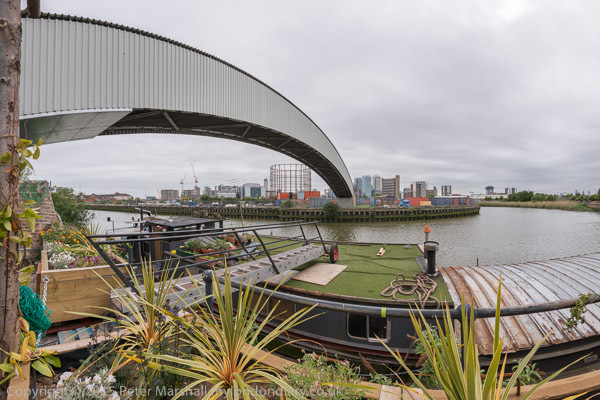 At the moment there is no public walkway along Bow Creek to the south of Cody Dock, although this may well be joined up to Canning Town and possibly beyond by 2016. Another awkward stretch of 'The Line' is at Twelvetrees Crescent, where the lack of steps down to the riverside path means an awkward detour alongside the busy Blackwall Tunnell Approach - or you can take a bus. At Cody Dock you can see Damien Hurst's Sensation (2003), a painted bronze based on anatomical models showing a section through human skin which are coloured to illustrate the different structures. It's doesn't seem a great work of art to me, though it was providing one child something to climb on while I was there. But the real attraction of the site is the rather spectacular riverscape, which the Hurst piece does nothing to detract from. 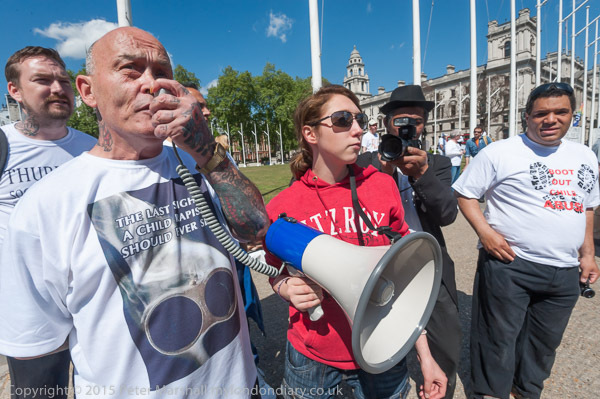 Around 30 ultra-right protesters came to the US Embassy to remember David Eden Lane, a convicted criminal and author of the '14 words' statement used by extreme right groups about securing a future for white childen. Protected by a large number of police they were opposed by a few anti-fascists. Lane was a member of 'The Order', a a white nationalist revolutionary organization active in the USA in 1983-4, which believed that the USA was controlled by a small group of prominent Jews, and carried out a series of violent robberies as well as counterfeiting to finance its activities - which included bombing a theatre and a synagogue -and those of related groups. They drew up a 'hit list' of prominent people, in June 1984 murdered Denver radio talk show host, Alan Berg, a Jew with liberal opinions who had attacked white racists on his show and was number two on their list, outside his home. Lane was the driver of the getaway car and was found guilty of racketeering and violating Berg's civil rights and was sentenced to a total of 190 years in prison. He died in jail in 2007. While inside prison, Lane, a former member of the Ku Klux Klan and the 'White Christian Separatist' group 'Aryan Nation' was also one of the founders of a new pagan religion, 'Wotanism', named after the Germanic god Odin, also know as Wotan. Conveniently his name is also an acronym for 'Will Of The Aryan Nation'. Wotanists see Lane as a prophet, and his two 14 word statements, along with his 88 precepts, as divine commandments. 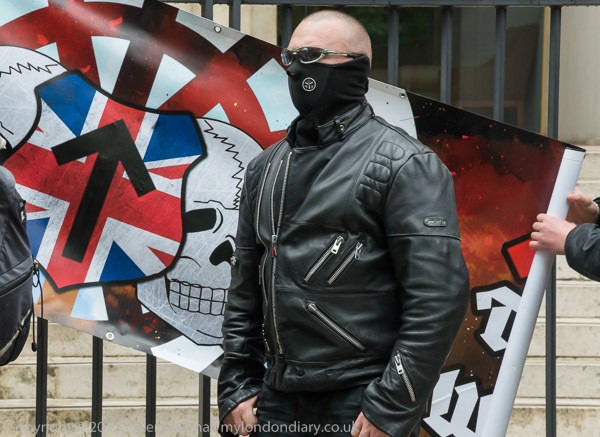 The protest outside the US Embassy for the 8th anniversary of his death brought together just under 30 people from various ultra-right groups in the UK. Surrounded by police and barracked by a small group of London Anti-fascists, they marched from outside a pub on the Edgware Rd to the US Embassy, where police kept the anti-fascists well away. It was rather a dissappointing turnout for both the right wing and the opposition. There were one or two gestures of hostility, expressions of hate and threats made to the three journalists who had come to record the event, particularly to a woman photographer. They complained as usual about misrepresentation in the press, though I think their real problem is that the press represent them only too accurately. I didn't ask the man who gave me a Nazi salute to do so, nor those who are wearing Neo-Nazi badges. I photographed as the protesters lined up for pictures by their own photographer in front of the embassy railings, and then left before the speeches started. 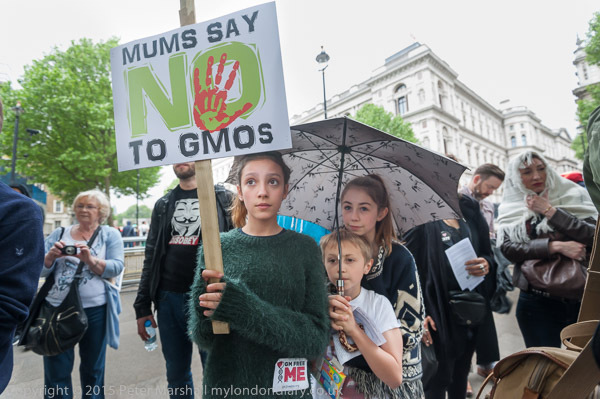 The London contribution to this year's annual global March Against Monsanto by over 3.5 million people in 600 cities around the world was a relatively small static protest at Downing St, backed by various groups supporting small-scale farmers and against GMO's in food, including MADGE Mums and with speakers and spoken word and musical performers. Monsanto and other large companies profiting in GMOs claim to be playing an important part in feeding the world's growing population, but they are attempting to monopolise food production for their own profit, patenting existing species, trying to prevent farmers from saving and using their own seed, encouraging the use of highly toxic chemicals and practices that degrade the soil. Even if Monsanto's seeds may raise crop yields, at least in the short term, the financial effects on both farmers adopting them and those continuing in traditional practices can be socially disatrous. Those using them are drawn further into the cash economy with the need for bank loans to buy seeds and pesticides, and the results of unusual weather or crop failure for other reasons may be financially disastrous, while increases in yields results in a lowering of the market price for all, including those not using the new technology. Genetic modification isn't in itself evil - and happens naturally, allowing the development of new strains and new species. But companies like Monsanto and their use of GM and their other activities present a danger to us all. We need, as the protesters today said, to plant our own seed, to grow local and to eat sustainable food, and to do so in our own ways in countries across the world. 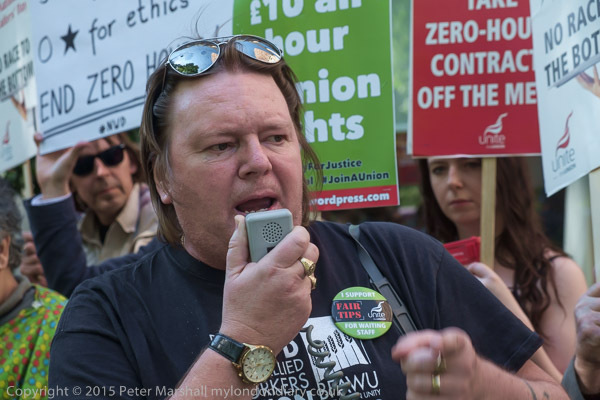 The Hotel Workers branch of Unite protested outside the Grosvenor House Hotel in Park Lane, the birthplace of Zero Hours Contracts, on National Waiters Day, calling for an end to poor conditions, poverty wages, zero hours contracts and management stealing of tips. I went to Photo London because I had an invitation to a talk about the book ‘The Gardener’ by Jan Brykczynski which I then wrote about at some length. After the talk I took advantage of the free day ticket to look around the rest of the event, which included a few exhibitions as well as the usual stands of art dealers and book publishers. 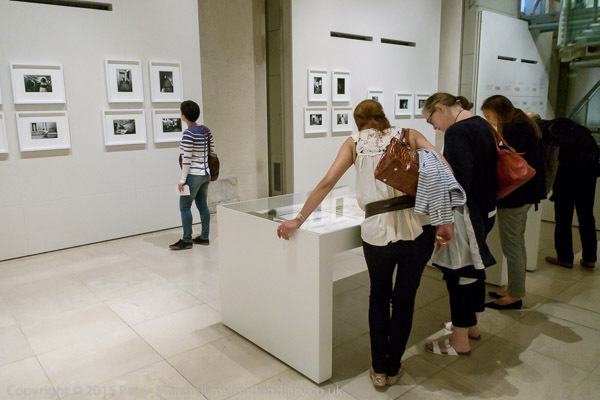 I wrote a second post on >Re:PHOTO about Photo London, and rather than repeat myself here, you can read it on that site if you are interested. Somerset House is a nice venue, though perhaps a little tricky for the disabled visitors, but there seemed to be more empty wall decoration than interesting work on show at many of the dealers, and a few of my favourites were missing (some at least because the organisers had wanted to to include those with blander but more saleable work.) And, at least for London, sales were apparently very good, particularly to overseas buyers. But there were relatively few works that were new to me that I found of interest, and much less of the old and familiar good work that it's always good to see again. And unlike every other year in Paris, virtually nothing happening outside the trade show. It may have been Paris Photo that has taken me there in half a dozen Novembers, but what I really go to see is the Mois de la Photo, the lively fringe festival and also the other galleries, including the MEP (Maison européenne de la photographie). It's a shame we have nothing like it in London, no real centre for photography and photographic life. 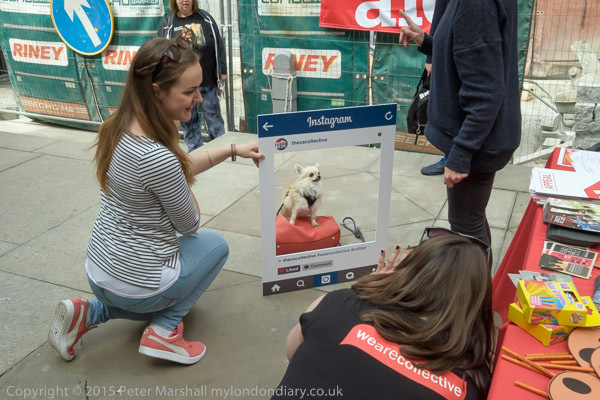 As in several previous years I accompanied my wife on a walk around some of London's churches, a fundraising event she was taking part in for Christian Aid. And since I was walking around and of course had a camera with me I took a few pictures, mainly inside the many Wren churches. Though perhaps my favourite is by Hawksmoor. I joined the cleaners at a United Voices of the World meeting in Bethnal Green before the demonstraton. The UVW is a grassroots trade union run on a voluntary basis and comprised almost entirely of low-paid migrant workers; most of the meeting was in Spanish, with some key items translated into English for the benefit of me and the few other non-Spanish speakers. 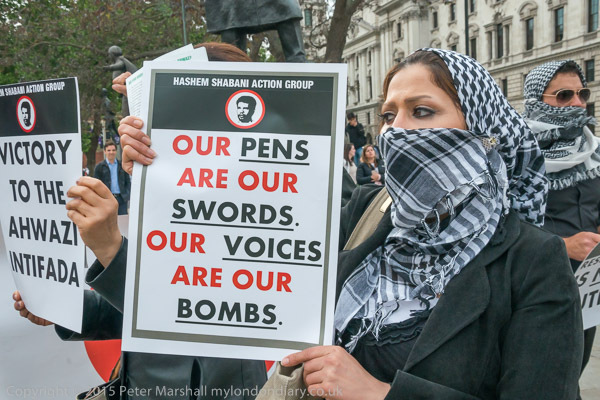 I travelled with them on the bus to Liverpool St and went with them as they walked quietly towards the Barbican Centre, stopping on the way to meet up with some others who were joining the protest. 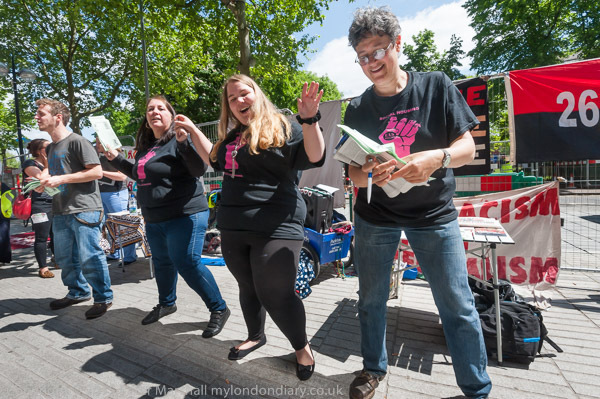 They waited until everyone had reached a street corner close to the Barbican, and then ran along the street and across the road through the main entrance of the Barbican Centre. Security there briefly stopped one or two, but the rest surged past and into the middle of the centre where they held a noisy protest. After some minutes, police arrived and the protesters began a noisy tour of the buillding, finally being stopped by police near to the doors leading to the lake. There was a heated discussion between UVW General Secretary Petross Elia leading the protest and police, with Barbican managers also joining in. Eventually the UVW agreed to leave by the route they had come in, and marched banging their drums and shouting through the centre to continue the protest on the street outside. The marched a little around the Barbican estate before returning to protest outside the main entrance to the arts centre. 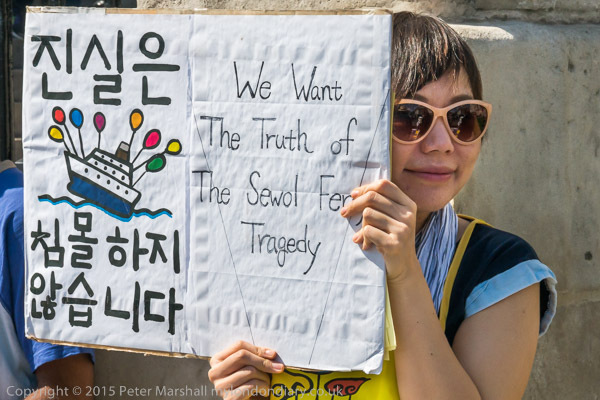 A monthly silent 'Stay Put' protest to remember the Sewol victims demanded the Korean government raises the ferry for a thorough inquiry, recovers all missing victims, punishes those responsible and enacts special anti-disaster regulations. 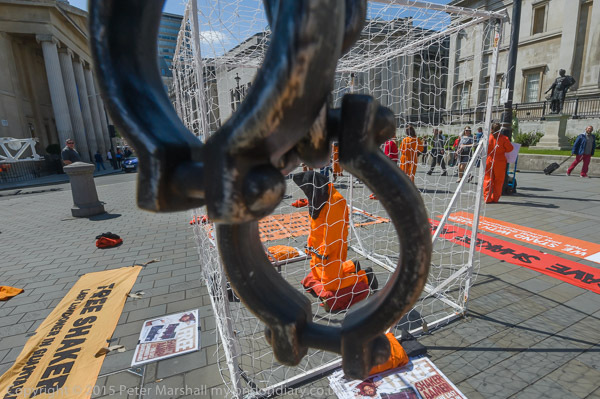 Becky from the campaign to free British Resident Shaker Aamer, a charity worker seized in Afghanistan now in his 14th year of unlawful imprisonment in Guantanamo, staged a 14 hr vigil to raise funds to send a delegation of MPs to Washington. Focus E15's weekly street stall, held there weekly for almost two years was this week a Victory Rally For Jasmin Stone after police dropped thecase against her. Jasmin was charged with squatting after police raided a flat she was visiting in April but charges were dropped 24hrs before the case was to be heard for lack of evidence; the arrest, like some other arrests of protesters, appears to have been simply a way to harass a prominent housing protester. There does seem to ba a process taking place with the intention of criminalising protests in Newham and elsewhere. It was my birthday, and a significant one, but for various reasons my family celebrations were taking place later, and a few of my photographer friends met me at lunchtime and very kindly took me out for a day in London, where we saw a few photography shows, failed to find another when driving rain obscured our vision, got very wet and took shelter in a pub or two and ended up having a very nice meal together before saying goodbye at Waterloo station. But the night was still young, and a bus took me to The Elephant, where I staggered through the subways to the private view of Continuum, where I came across a number of old friends in photography too. It had been a good way to spend my birthday. 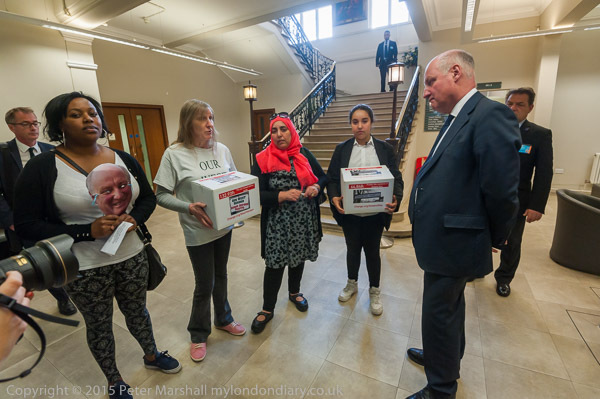 People facing eviction as Barnet Council hands their estates to property developers brought petitions with over 200,000 signatures to council leader Richard Cornelius. There were angry scenes as security restricted access to the town hall meeting. Residents and former residents from Sweets Way and West Hendon estates met outside Barnet Town Hall where councillors and guests were arriving for a town hall meeting. A small group was allowed inside to present a petition to council leader Cornelius, and security allowed me inside after I showed them my press card. When I started to photograph the handover, a council press officer intervened, looked at my press card and told me I could not take any pictures. Fortunately by the time he told me I had already taken several. He then instructed security to take me out of the building. I went with them, still protesting, and was slowly pushed towards the door. It wasn't possible then for me to leave as a large crowd of protesters was attempting to push its way inside. Another photographer who had been allowed to take photographs stood in the lobby with me, and we both took pictures, despite the security men telling me I was not allowed to do so. There seemed to me to be a clear public interest in recording what I could see. Through a window at the side of the lobby I could see into another room at the front of the building and realised that people were attempting to climb in through an open window, with council staff blocking them. I and the other photographer both started taking pictures through the glass, but soon another security man was on the other side attempting to block our view. The security men then helped me out through the crush, which had subsided a little. They had behaved reasonably and I think were probably not happy at having to carry out the orders they had been given by the council officer, and our disagrements were relatively polite, but they made clear that I would not be allowed back into the town hall. I photographed the protesters still holding the window open from the outside. A few people were by now being allowed into the public meeting, but most of the protesters - as well as myself- were kept out. It was in any case time I was on my way home. Maimuna Jawo fled The Gambia in her fight against FGM (Female Genital Mutilation), refusing to take over her family's duty as her village's 'cutter' when her mother died. 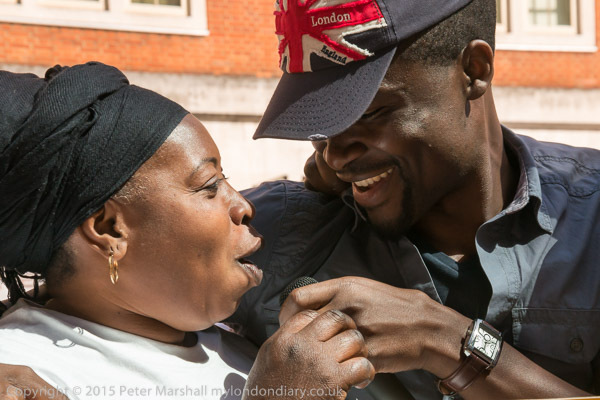 In the UK she was held in Yarls Wood, and now her asylum claim has been rejected. Maimuna is next in line to be a cutter, and is expected to train her daughter to do the same. Tradition dictates that the cutter must come from one familial lineage, so by not being there, Maimuna is stopping girls from being cut. When she came to the UK it was out of a courage and determination not to take up the role following her own mothers passing. She has denied her village their cutter by leaving it behind; but rather than celebrate and support this move, the Home Office have been bent on deporting Maimuna back to face the relentless pressure from the authorities to take up the knife. They say that the Home Office have refused to look at the evidence about her, including from a BBC TV documentary team who went and interviewed in her home village and expert testimony about the role of FGM in the state and national organisation. They state that she has been refused a right to appeal to a court as the Home Office actions would then be exposed to press and public, and would show the government's claim of wanting to end FGM to be a sham. 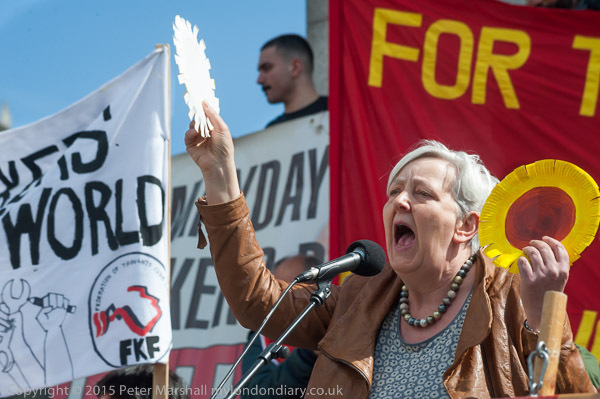 The protest was organised by the Movement for Justice, and among those who came to speak in support of Maimuna was Green Party Leader Natalie Bennett. 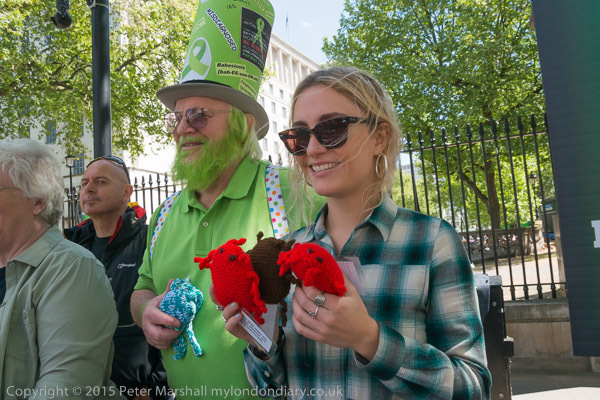 Campaigners at Downing St highlighted the serious dangers of Lyme Disease from tick bites, calling for public education and for the NHS to abandon useless tests and tackle this killing disease seriously with effective tests and treatments. Lyme disease, or borreliosis, is becomiing increasingly more common across Europe and the USA, and all those who walk or work in woods, parks and even gardens are at risk. Spread by bites from infected ticks, it is hard to diagnose and often goes untreated, with few doctors being aware how serious and widespread it is, often leading to partial or complete disablement. The tests still recommended under the NHS are extremely unreliable, and the disease can give a wide range of symptoms and is often misdiagnosed as ibromyalgia, Arthritis, Chronic Fatigue Syndrome, M.E., Multiple Sclerosis, Dementia/Alzheimer’s, psychiatric disorders, Depression, Motor Neurone Disease (ALS) or viral illness. Better diagnostic methods are available, but vested interests are preventing them being adopted. The campaigners want Lyme to be made a notifiable disease, for better methods of diagnosis to be actively explored and for doctors the be trained in the treatment of this and other tick-borne diseases. Extended treatment with high dose, combination or long-term antibiotics can be succesful in treating Lyme disease, though a 5-year follow-up is said to be advisable. The also want all government bodies for the Environment, Health, Sport and Tourism to raise awareness of problem of tick bites, and of the need to check for ticks after outside activities, and to remove any found in an appropriate manner. Prompt proper removal greatly reduces the risk of infection, and is best performed with the aid of a small cheap plastic tool (such as the O'Tom Tick Twister) which could be made very readily available for a few pence - although currently they cost from around £2.60 up. It would be useful fro thest to be included in commercial First Aid kits. If tick removal is carried out improperly, the risk of infection is high. Adult survivors of child abuse and whistleblowers united called on parliament to end abuse in the care system, to believe and act upon children's reports of being abused and to end the covering up of abuse. A number of those present told me a little of their own personal stories of reporting abuse and of no action having been taken by social services and police. One father had continued to report possible abuse of his son who was living with his former wife. Eventually his reports led to an investigation, and he has been offered financial compensation - but that was no compensation for the abuse of his son. Some making complaints had found themselves under investigation and the complaints had led to their children being taken away or access to them being refused. As well as their own personal stories, the protesters were well aware of the complaints that have been made against prominent people, including members of parliament, where investigations have been dropped despite clear evidence. I went to a weekend event in Middleton, and on Saturday went for a short walk before breakfast to the Rochdale Canal. In the afternoon, together with a few others we started the same way but then walked another five miles or so, through Tandle Hill Country Park, back to where we were staying. 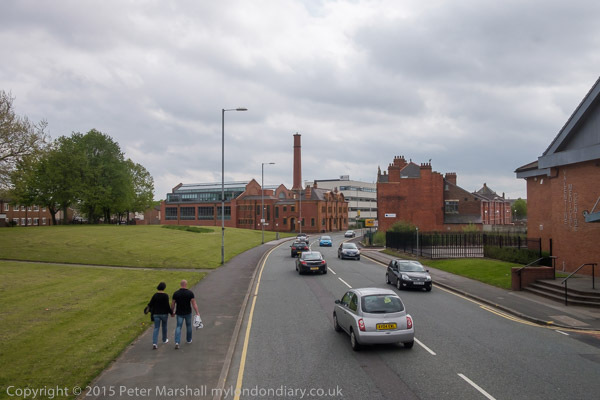 We went for a short walk, taking us again along the Rochdale Canal, and then going back through some streets I often walked along around 40 years ago. I've not spent a lot of time in Manchester in the interval, and only a few seemed familiar. Much has changed, though one of the buildings I worked in still looked much the same from outside. I hardly took any photographs of Manchester in the seven years I spent there. Mainly because I simply couldn't afford it. And those I did were not helped by having dropped my camera in a lake at Versailles, where it spent perhaps half an hour under water. It was never the same again, with a shutter that stuck and gave quite unpredictable exposures. But walking through the city I felt how much I had missed. 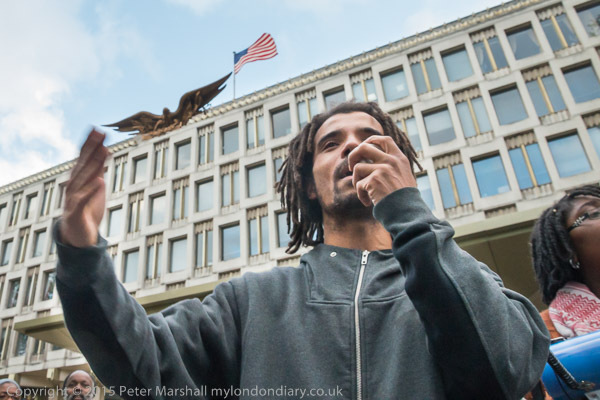 London Campaign Against Police and State Violence held a solidarity vigil to stand with the family and friends of victims of police violence in Baltimore: Freddie Gray, Mya Hall and also victims of police brutality in the UK. Among groups supporting the solidarity vigil with the family and friends of victims of police violence in Baltimore were the United Families & Friends Campaign (UFFC), Defend the Right to Protest, NUS black students and the Cole Family Truth Campaign. My son was a 20 year old athlete studying sports science at university of Bedfordshire. On Sunday 5th May 2013, Julian was alone, outside Elements Nightclub in Bedford, we believe he was asking for a refund after he and his friends had been asked to leave the club. Security guards grabbed Julian and passed him to police officers who were outside the club. Initially all my family and I knew, was that Julian had suffered a severe spinal injury, brain injury and cardiac arrest following this contact with the police. Just like Freddie Gray, the injuries themselves began to give us some idea as to what happened. Julian’s injury is ‘hangman’s fracture’. It is the kind of injury associated with the sudden and violent pulling backwards of the head, usually when there is a counter force against the body. Julian has been left paralysed and in a vegetative state. He needs 24-hour care for as long as he lives. Police initially denied they had used any force, but video and eyewitness evidence forced them to change their story. People saw him being dragged unconscious into a police van. The IPCC investigation has still to be completed and the family's questions about his death remain unanswered. Another powerful speech was by Marcia Rigg of the Sean Rigg Justice & Change Campaign and the United Families and Friends Campaign, still fighting for justice over the killing of her brother Sean in Brixton Police station in August 2008. Although the inquest found that police had used unsuitable and unnecessary force, no officer has yet been charged over his death. 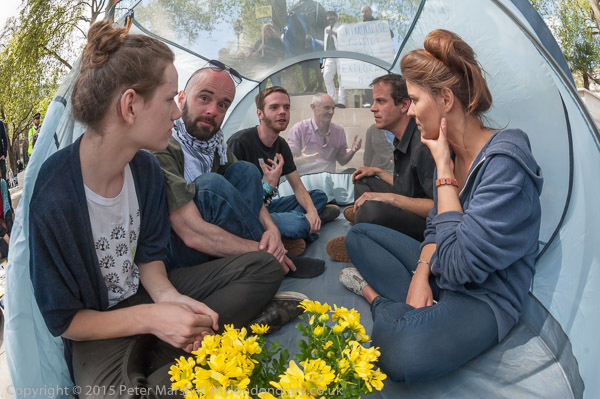 A rally and meditation by Occupy Democracy at the statue of Gandhi, noted for his direct action civil disobedince, called for fossil fuel exploration and investment to be made a crime, and defied the ban on tarpaulin and tents in Parliament Square. 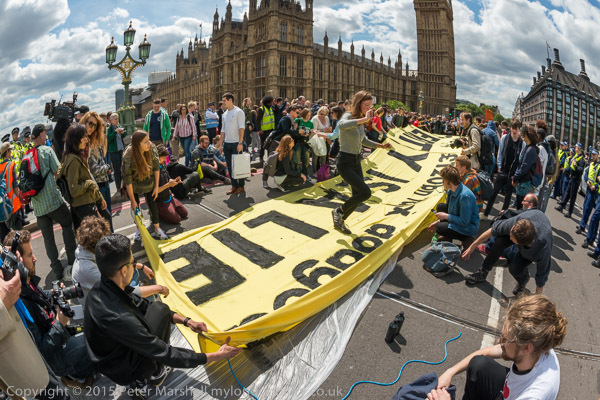 Donnachadh McCarthy introduced the protest on the grass in Trafalgar Square, after which tarpaulins were moved to the paving in front of Ghandi and people moved to sit in a circle there around a large blue tarpaulin with the message 'Criminalize Fossil Fuel Exploration'. During the meditation that followed, Donnachadh and another person leading the event got up and wrapped a blue tarpaulin around Gandhi. A couple of minutes later two heritage wardens came and asked for it to be removed, and when it was not they seized it and took it away. Immediately two other protesters brought up a second blue wrap and held it around the statue, taking care for a minute or two to avoid it actually contacting the statue and the heritage wardens withdrew to watch with police a few yards away. At the end of the meditation, Donnachadh announced an act of civil disobedience and pulled a folding tent onto the tarpaulin on the pavement in front of him and erected it. Several people then came and sat inside it, and the protest continued. After around half an hour several police officers, at the urging of the heritage wardens, came over to the tent and informed those inside, who now included Donnachadh, that they were committing an offence and might be arrested if they failed to leave. The police then withdrew. Twelve minutes later, as Big Ben struck two o'clock, around 20 police marched towards the tent from both sides and surrounded it. Donnachadh who had been standing in front of it quickly jumped back inside as they approached. Police allowed a legal observer to stand inside the ring of officers around the tent to give advice as those inside were again told they would be arrested unless they left. It was a little difficult to see exactly what happened through the ring of officers, but a couple of people appeared to leave at this point, and police then went inside the small tent and pulled out the others - who had joined their arms around each other - out one by one. I followed Donnachadh as he was dragged and then carried away by police, still shouting against fossil fuels as he was put into a police van at the west side of the square. After the final protester was pulled out and carried away, police brought out out the remains of the tent, torn and broken. The protest continued rather more quietly around Gandhi and people began to leave. Police and Heritage Wardens watched Day 3 of Occupy Democracy's 10 day 'Festival of Democracy' in Parliament Square "building a movement for real democracy: free from corporate control, working for people and planet!" but did not intervene. I arrived close to the end of a panel discussion on “Party Funding and Cash for Peerages” with investigative journalist Tom Warren, Andrew Mell who was lead author on Oxford University’s cash-for-peerages report and Donnachadh McCarthy – former Lib Dem vice-chair and author of The Prostitute State who has seen the corruption of parliamentarians from the inside. There was a short break before the start of hustings for candidates from parties excluded from taking a proper part in the media debates, although only two - from the Green Party and TUSC had turned up by the time I left. Various other presentations and meetings were scheduled to continue until well after 9pm. The occupation is set to continue until May 10th. • a citizen-led constitutional convention for real democracy. Perhaps because of the absence of their political masters from Westminster and their preoccupation with the election, there seemed to be none of of the vendetta by heritage wardens and police against Occupy Democracy, though it remains to be seen if this relaxation is only temporary. 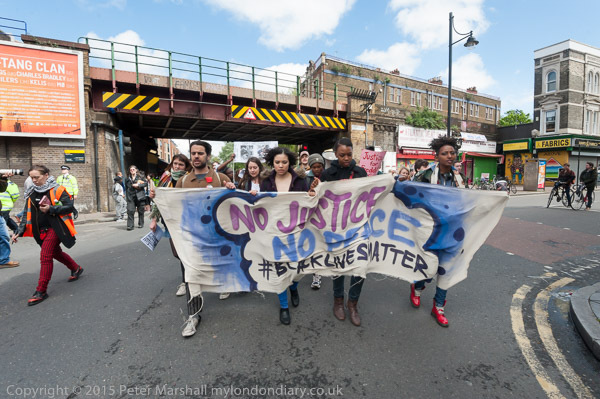 Baltimore to Brixton - Black Lives Matter! The killing of Freddie Gray in Baltimore and police attacks on his funeral resulted in huge protests there and elsewhere against police murders and militarised policing. A protest in Brixton sent solidarity and pointed out similar problems in Brixton and the UK. People were slow to arrive at the meeting point for the march on Coldharbour Lane in front of the Moorlands Estate, but eventually a decent crowd assembled. Class War had come with their Lucy Parsons banner, and there were more banners from the International People's Democratic Uhuru Movement and Reclaim Brixton as well as the London Black Revs and the main banner for the event with the message 'No Justice, No Peace #BlackLivesMatter'. Women of Colour and the All-African Women's Group from the Global Women's Strike and a number of other people had brought placards, and the protest was also supported by a wide range of other groups including Brixton Latin American Community, Mexica Movement London Chapter, Our Brixton, Latin Brixton, Justice for Christopher Alder, BirminghamStrong, Justice 4 ALL, The Brick Lane Debates, Occupy UAL, RCG, Revolutionary Communist Group, Occupy London, Rojava Solidarity Working Group, Algeria Solidarity Campaign, Environmental Justice North Africa and Justice4Paps. On April 12, 2015, Freddie Gray, a 25-year-old African American, was brutalised and pulled into a police van. His larynx was crushed & 80% of his spine was severed at the neck. A funeral attended by baltimore Highschool students was attacked by riot police, footage shows stones being thrown by Baltimore PD, provoking local youth. In the past few days, Baltimore has been gripped by a riots against police brutality, murders, militarised policing and the deployment of the National Guard. The march started by going through the 'Barrier Block' of Southwyck House, a vast and formidable 1970s concrete block, built to shield the estate from an innercity motorway that fortunately never materialised, making its way through the estate to with a brief halt at its centre to emerge onto Loughborough Park opposite the Loughborough Park Estate where the Guiness Trust occupation was taking place. The march didn't stop there, but returned up Moorlands Road to Coldharbour Lane, then marched along this into the centre of Brixton to Windrush Square for a rally. Speakers at the rally included Tisha Brown, a former resident of Maryland and member of London Black Revs, Algerian writer and co-founder of the Algerian Solidarity Campaign Hamza Hamouchene and Rashid Nix, a community activist from the area standing as Green Party candidate for Dulwich and West Norwood. At the end of the rally most of those present went on a march on the Brixton Road up past Brixton Underground Station and on to Loughborough Rd, returning eventually to Coldharbour Lane, this time turning down Somerleyton Road and stopping at the community building, Number Six. The march was going to continue after a rest there, but I had already walked too far, and walked to catch a bus to Westminster. 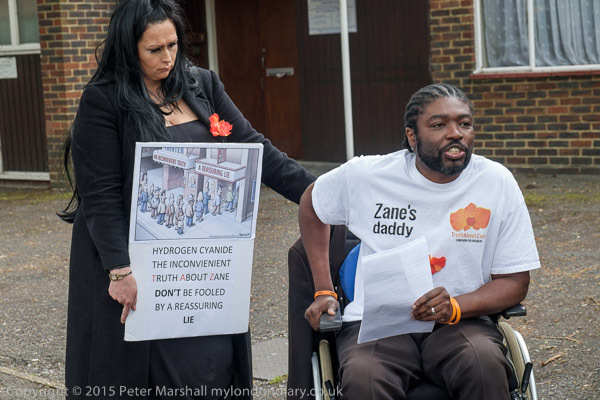 Kye Gbangbola spoke at a protest organised by TUSC outside the Spelthorne Tory HQ in Cherry Gardens on the cover-up of his son Zane's death in the floods, and wider implications. Spelthorne council has been very slow to react to the questions raised by the death which Zane's parents beleive to have been caused by hydrogen cyanide released by flood water on unsafe landfill. They want the council to investigate and take action not just over this site, but at others in the borough that could lead to similar deaths in the future. Others who spoke at the event including both Paul Couchman, Save Our Services in Surrey and Spelthorne TUSC candidate, Paul Jacobs, Green Party candidate for Spelthorne constituency and Stanwell North ward and actress Elizabeth Mansfield, Green Party local election candidate for Riverside & Laleham, raised Tory failings over flooding, the Shepperton incinerator and fire station closures. 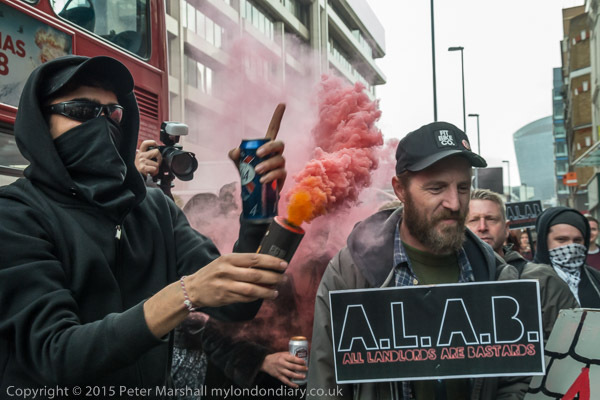 Class War and others had planned an "epic street party" outside One Commercial Street, with mobile sound systems, dancing, banners and coloured flares. After taking over the roads outside the block they marched away. 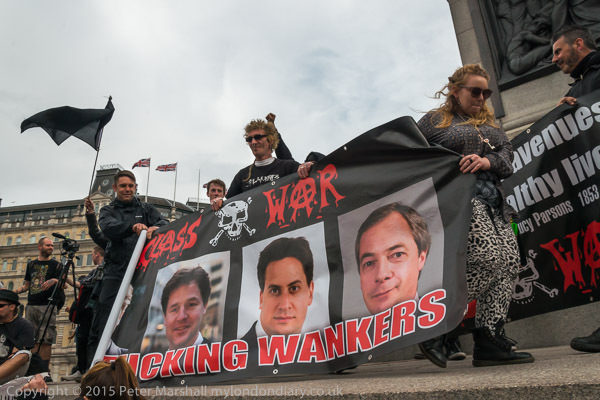 There was a party atmosphere from the start as Class War arrived with their banners outside One Commercial St for the May Day party at 'Poor Doors', and loud cheers as they unfurled the replacement Political leaders banner, with its images of the four party leaders and the message 'All f**king wankers'. Even some of the police seemed a little amused. Police still hold the original banner, produced for and used widely at the time of the 2010 election and since, and now rather out of date, with an image of Gordon Brown rather than Ed Miliband. 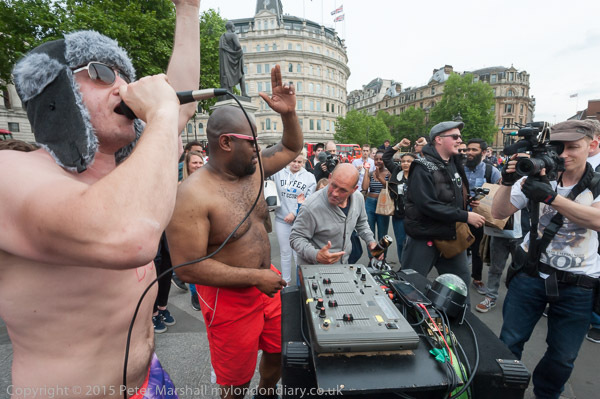 The party really took off when a mobile sound system arrived, pushed by several black clad and face-masked people, a small house on wheels with the slogan 'affordable housing' on its roof and two large loudspeaker horns on a post at its centre. People began to dance around it and the air was soon filled with the smoke from a number of flares, at times too thick to see or take pictures. The protest soon spread out onto the road, blocking the traffic, and the signal came to take to the street for a march. I left as they headed down towards Tower Bridge for another protest there, having been on my feet for far too long. I'd already photographed Tower Bridge being blocked and needed to go home. 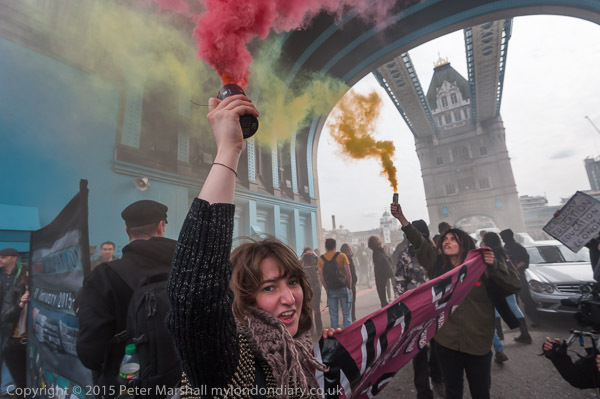 Anti-capitalist protesters, led by Class War with the Lucy Parsons banner, marched on to Tower Bridge this afternoon and blocked traffic, calling for social housing not social cleansing, with social housing for Londoners and an end to cuts in foundation courses and other aspects of education. People met on a small area of green space close to Tower Gateway station, and were soon joined by a few police liasion officers keen to find out what they intended to do. Eventually they formed into a march and marched onto the bridge, stopping the traffic in both directions as they held a short protest, displaying banners, letting off flares and chanting about the need for more council housing and for an end to education cuts. They then marched to the south end of the bridge and turned into Tooley St. I left them as they marched past London Bridge station on their way back to protest further in Westminster. 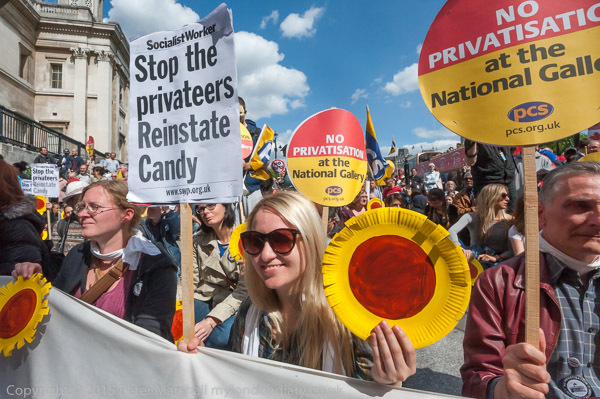 Workers striking against privatisation at the National Gallery handed out 1,000 cardboard sunflowers to marchers entering Trafalgar Square for the rally, and victimised PCS rep Candy Udwin made a powerful speech. 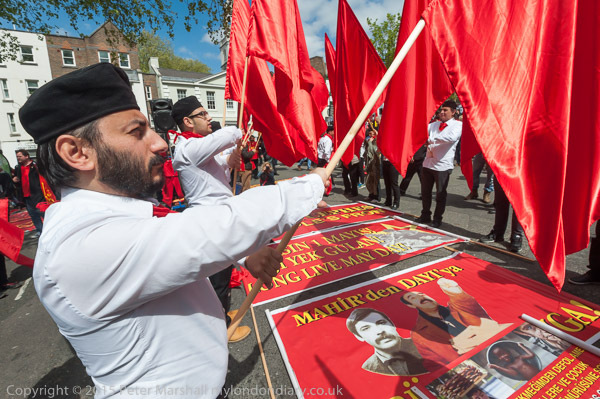 Trade unionists, migrant workers and members of London's diverse communities and organisations marched through London to celebrate May Day and stand up against austerity and for human rights, trade union rights and international solidarity. As well as a strong presence from London's many communities including Halk Cephesi, the Turkish Popular Front, behind the many trade union banners, there was as usual some lively anti-capitalist protesters, who half-way along the Clekerkenwell Road decided to liven proceedings a little by marching along on the other side of the road, where traffic was still flowing. There were a few minor incidents as police tried to persuade them that this was unsafe, as if they were unaware of the dangers of traffic, and small scuffle broke out briefly as police started to search one of them. 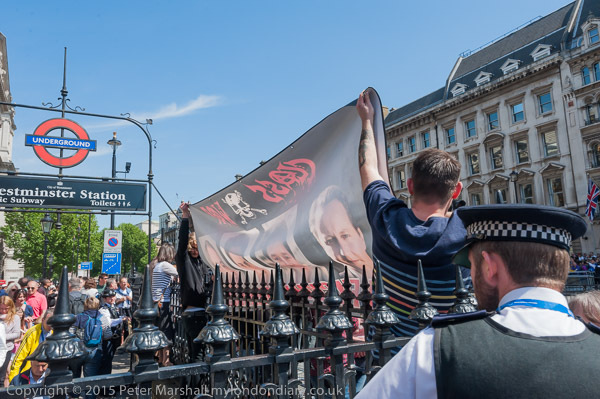 As the march approached Trafalgar Square, the Class War banner entered first, around 50 yards ahead of the main march banner, along with a few other protesters.